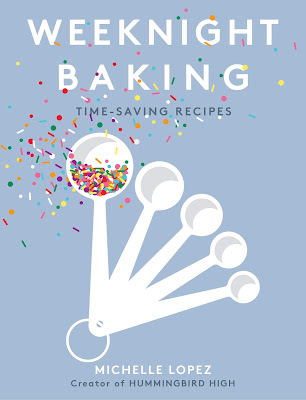 The recipes for #weeknightbakingbook are all done and I am so very excited. Don't get me wrong — there's still lots left to do. Headnotes and essays still need to be written, photos still need to be taken, etc, etc. But recipe development was definitely the most time consuming portion of the book and my body is happy to be taking a break from all the taste tests for the time being. It turns out my 30-year-old body (31 next week, ugh) cannot handle all that sugar the way it used to, eeeeep. If you don't follow Melissa (a.k.a. The Fauxmartha) on her blog or her Instagram, you're missing out! 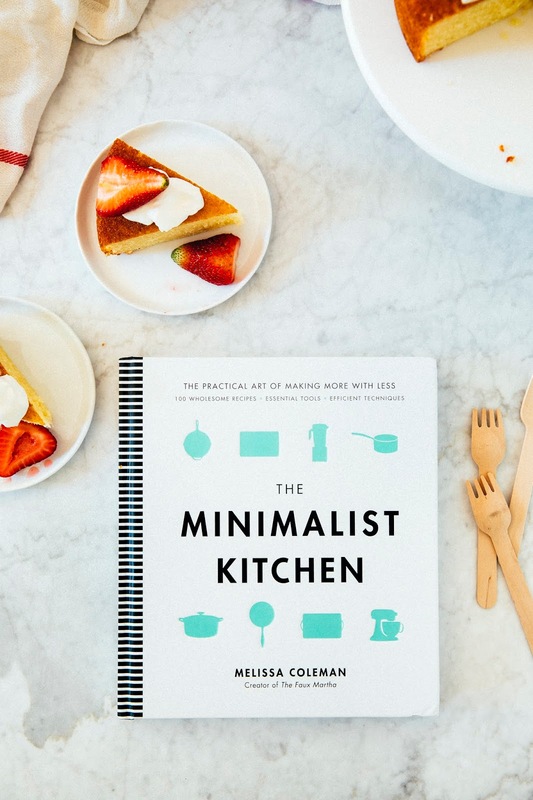 She writes about all things minimalist — recipes, interiors, general life living — and does so in an approachable and attainable way. 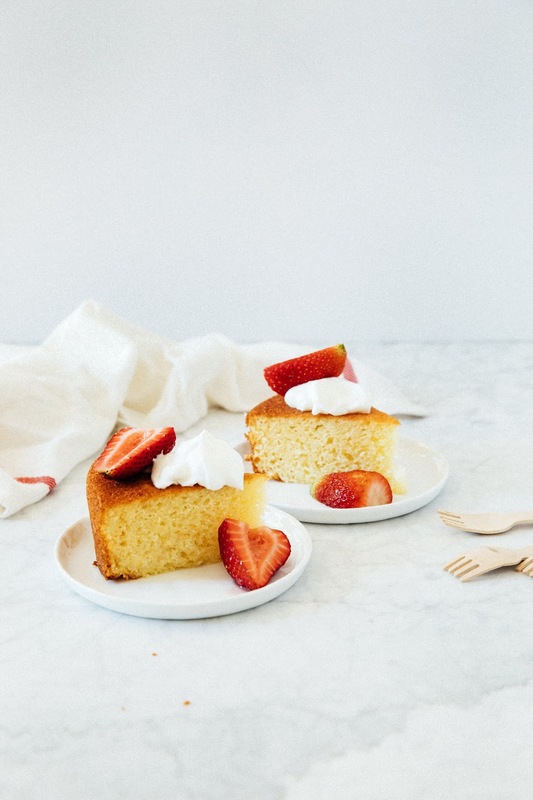 Like this yogurt shortcake! 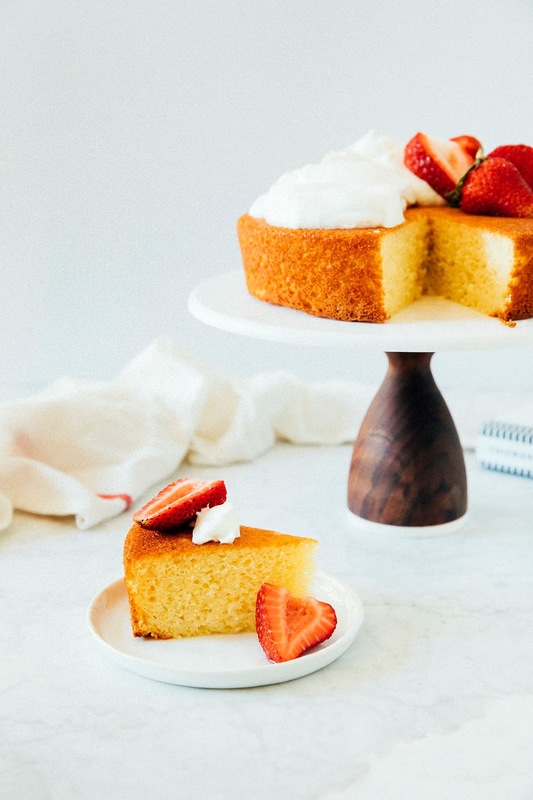 It's perfect because you'll likely already have the ingredients needed for the cake on hand, and the recipe only really requires two bowls. 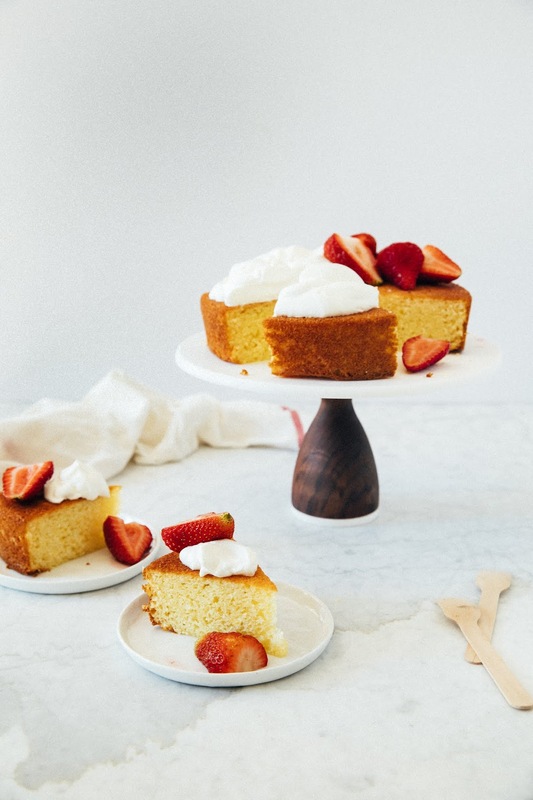 Despite this simplicity, it produces a cake with a wonderful light crumb and a subtle tangy flavor that works well with the berries and cream. I'm not sure exactly when Melissa and I became friends, but last year we finally had the chance to hang out IRL in New York (we were very basic: dinner at Parm, banana pudding at Magnolia Bakery) and Melissa is every bit as funny, smart, and talented as she is online. 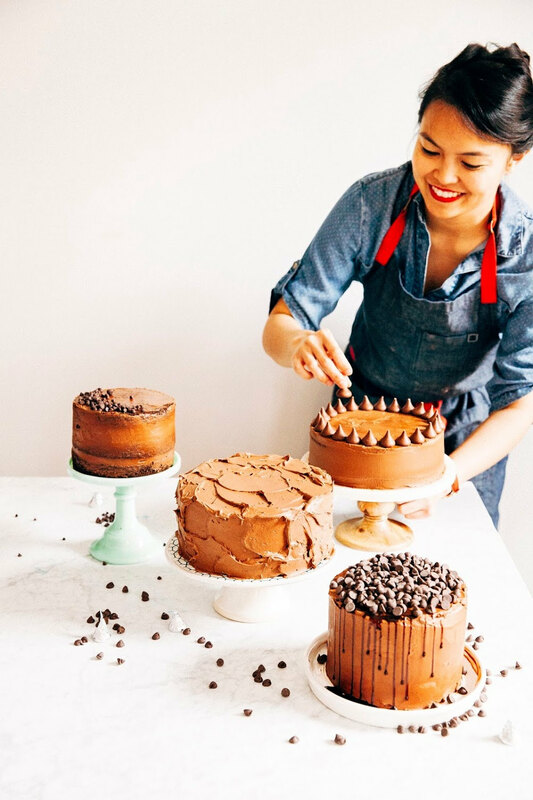 Her new cookbook captures her philosophies perfectly, filled with simple but tasty everyday recipes and tips for organizing your kitchen minimally and more. Enjoy! Maceration refers to the process of tossing berries in sugar and, traditionally, a little bit of alcohol to encourage them to release their juices. Your berries might not need this if they're super ripe and juicy — if you macerate super ripe and juicy berries, they might turn too mushy. It's best to serve super ripe berries as they are. The process really only works best with slightly underripe berries that are not at their best and are a little crunchy, so use your judgement! Also, note that the more underripe your berries are, the longer the maceration process will take, so plan accordingly. In a medium bowl, toss together 3 cups prepared strawberries, 2 tablespoons granulated sugar, and a pinch of kosher salt. Set aside, uncovered, at room temperature for at least 30 minutes, or until the berries soften and start to release their juices. Macerated strawberries can keep in the refrigerator overnight. Center a rack in the oven and preheat to 350 (F). Lightly spray the interior sides of an 8-inch round cake pan with cooking spray and line the bottom with a parchment paper circle; spray the parchment paper as well and set aside. In a small bowl, whisk together 1 1/2 cups all-purpose flour, 2 teaspoons baking powder, and 1/2 teaspoon kosher salt. Set aside. In a medium bowl, whisk together 1 cup granulated sugar, 1/2 cup plain whole-milk yogurt, 1/2 cup canola oil, 1/4 cup whole milk, 2 large eggs, and 1 teaspoon pure vanilla extract until smooth and a pale yellow color. Sprinkle the dry ingredients (from the 2nd step) over the wet ingredients and use a rubber spatula to gently fold together until just combined. 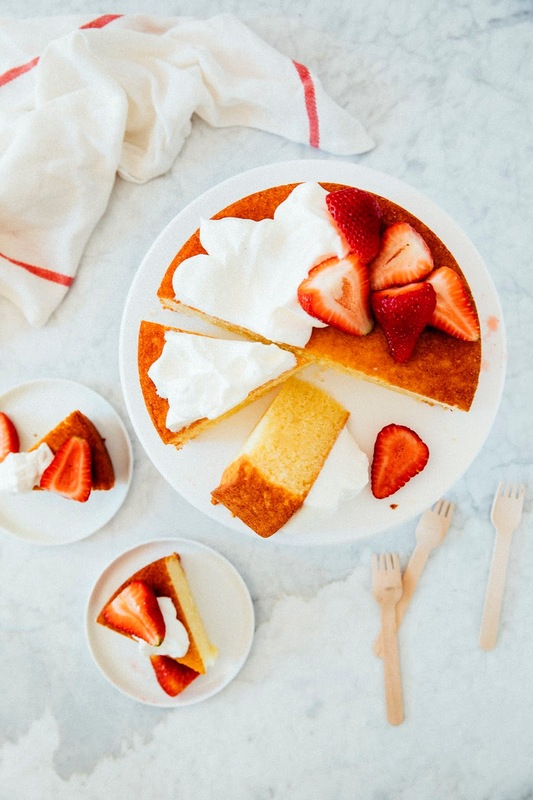 Pour the batter into the prepared pan, and bake for 40 to 45 minutes or until a skewer inserted into the center of the cake comes out clean. Transfer to a wire rack and cool at least 15 minutes in the pan, before turning out onto the wire rack to cool for another 30 minutes. 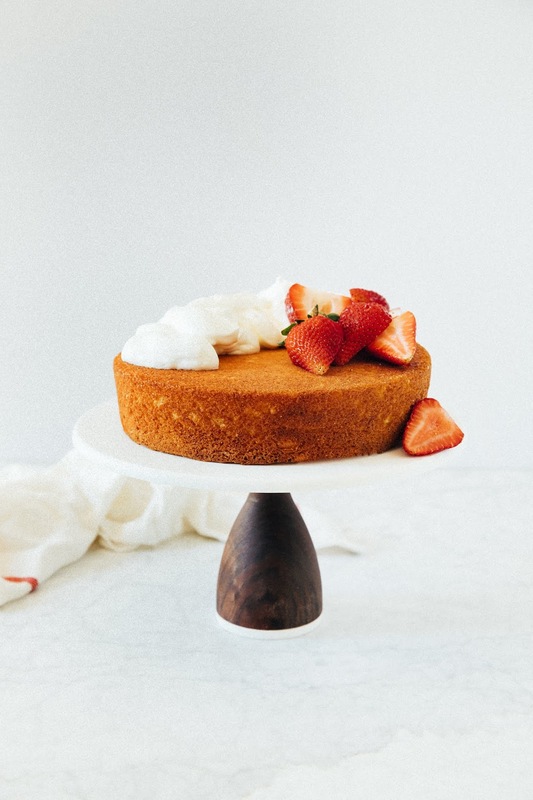 In the bowl of a freestanding electric mixer fitted with a whisk attachment, combine 1 cup heavy cream and 3 tablespoons confectioners' sugar. Beat on high until medium-stiff peaks form, about 3 to 4 minutes. Slice the cake and top with the whipped cream and strawberries.